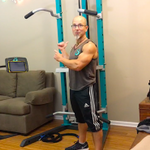 This simple neck training sequence can be done daily, and is GREAT to do when traveling. This is ideal for rebuilding and re-conditioning weak, atrophied neck muscles (a VERY common problem) and relieving a stiff, achy neck. It is also ideal for preventing neck spasms and random muscle pulls that plague many sedentary, de-conditioned people. The neck has MANY muscles that are responsible for keeping our heads attached to our torsos, AND for protecting everything that is underneath them - in addition to being the primary movers and controllers of head movement. Think about that. The problem is almost everyone NEGLECTS to properly train and maintain "neck fitness". Even people who are into the fitness lifestyle don't know they are supposed to be training their neck muscles a few times per week. This neck exercise routine is part of my overall fitness/wellness plan. It has "saved my neck" from many issues and injuries over the last 18 years.